The idea was proposed at the 1948 Summer Olympics by Muhammed Taher Pasha, chairman of the Egyptian Olympic Committee and vice-president of the International Olympic Committee (I.O.C. ), assisted by the Greek member of the I.O.C. Ioannis Ketseas. In 1949 an unofficial event was held in Istanbul, Turkey but the first official Mediterranean Games were held in Egypt in 1951. The Games were inaugurated in October 1951, in Alexandria, Egypt, in honour of Muhammed Taher Pasha, with contests being held in 13 sports along with the participation of 734 athletes from 10 countries. In 1955, in Barcelona, during the II Games, the set up was decided of a Supervisory and Controlling Body for the Games, a kind of Executive Committee. The decisions were finally materialized on 16 June 1961, and the said Body was named, upon a Greek notion, ICMG (International Committee for the Mediterranean Games).Twelve countries were hosted for Mediterranean Games - four from Africa: Egypt (1951), Tunisia (1967, 2001), Algeria (1975) and Morocco (1983); six from Europe: Spain (1955, 2005, 2018), Italy (1963, 1997, 2009), Turkey (1971, 2013), Yugoslavia (1979), Greece (1991) and France (1993) and two from Asia: Lebanon (1959) and Syria (1987). The first 11 games took place always one year preceding the Summer Olympic Games. However, from 1993 on, they were held the year following the Olympic games. This transition meant that the only time the Mediterranean Games were not held four years after the previous Games was in 1993, when Languedoc-Roussillon in France hosted the Games just two years after Athens. The Mediterranean Games, in terms of the preparation and composition of the National Delegation, are held under the auspices of the International Olympic Committee and the Hellenic Olympic Committee (HOC). However, their establishment too must be credited to the HOC, for it held a leading part in their being founded despite all difficulties. Athens is the permanent seat of the ICMG (regardless of who the President might be) and the Committee’s General Secretary is Greek. This comes as a further tribute to Greece, highlighting its leading role with regard to the function and strengthening of the institution. Except that Greece bailed out of its 2013 Mediterranean Games commitment when the two cities of Volos and Larissa were supposed to host the 2013 edition of the Games. But because of Greece's financial troubles, they had to give that up and the 2013 honors went instead to Turkey, with the city of Mersin rescuing the 2013 edition of the Games instead. The logo of the games, also referred to as the "Mediterranean Olympics", is composed of three white rings symbolically representing Africa, Asia, and Europe — the three continents that border the Mediterranean Sea. This logo has been used since the Split games in 1979, for which it was devised and afterwards accepted for the whole Games. During the closing ceremony, the flag of the games is transferred to the country of the city chosen for the organization of the next Mediterranean Games. Europe: Albania, Andorra, Bosnia and Herzegovina, Croatia, Cyprus, France, Greece, Italy, Kosovo, Malta, Monaco, Montenegro, North Macedonia, Portugal, San Marino, Serbia, Slovenia, Spain and Turkey. Kosovo was accepted as a member of the International Committee of Mediterranean Games in October 2015 and participated for the first time in the 2018 Mediterranean Games in Tarragona, Spain. Of all the National Olympic Committees within the Olympic Movement bordering the Mediterranean Sea, Israel and Palestine have not participated in the games, nor has Great Britain who represents the British Overseas Territory of Gibraltar. In the case of Israel, Allen Guttman in The Games Must Go On argued that Israel's exclusion is both antisemitic and politically motivated due to antagonism towards Israel by the participating Arab nations. The IOC's Avery Brundage was not supportive of Israel's desire to compete, saying: "I cannot understand why anyone wants to go where he is not wanted". The International Amateur Athletics Federation pushed the issue at the 1959 Mediterranean Games in Beirut by refusing to grant permission to hold an athletics competition unless Israel were allowed to compete. Lebanese games organizer Gabriel Gemayel conceded to this, but sidestepped the ruling by holding a parallel Lebanese Games comprising athletics events between the present nations alongside the official Mediterranean Games competitions. 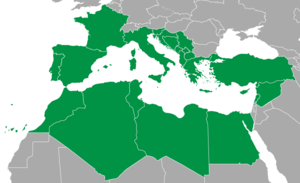 There are countries not bordering the Mediterranean Sea which nonetheless participate: Portugal, Andorra, Kosovo, San Marino, Serbia and North Macedonia. The Hellenic Olympic Committee has suggested that nine more countries that do not satisfy geographic criteria could be allowed to participate, such as Bulgaria, and some Arab countries such as Jordan and Iraq. Portugal competed in the 2018 Mediterranean Games after a decision which approved Portugal as effective National Olympic Committee. The symbol of the Mediterranean Games consists of three rings representing Asia, Africa and Europe, the three continents involved in this competition. The rings dissolve in a wavy line in their lower part, as if they were immersed in the Mediterranean Sea. During the closing ceremony, the flag is transferred to the country of the city chosen to host the next Mediterranean Games. No inland city has ever hosted the games. All but one of the host cities to date have been situated on the Mediterranean coast (Casablanca is located on the Atlantic coast). The International Mediterranean Games Committee held a meeting on October 20, 2012 in Mersin, Turkey, and decided to organize the Mediterranean Beach Games every 4 years starting from 2015. The Games consist only water sports and beach sports, which aim at bringing together young athletes of the Mediterranean area, giving them the opportunity to participate in sport events. Pescara, Italy was awarded the rights to host the first edition of the Mediterranean Beach Games from 28 August to 6 September. The sports included in the program of the 1st Mediterranean Beach Games are the following: Aquathlon, Beach Handball, Beach Soccer, Beach Tennis, Beach Volley, Beach Wrestling, Finswimming, Canoe Ocean Racing, Open Water Swimming, Rowing Beach Sprint, Water Ski. Yugoslavia competed in 1997 and 2001 as FR Yugoslavia. Serbia competed in 2005 as Serbia and Montenegro. Throughout the history of the Mediterranean Games, 33 different sports have been presented. ^ "History of the Mediterranean Games". International Committee of Mediterranean Games. CIJM. Retrieved 21 June 2015. ^ "Mediterranean Games". gbrathletics.com. Retrieved 21 December 2012. 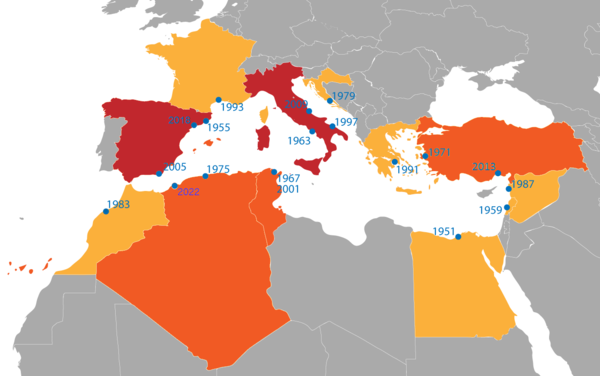 The Mediterranean Games were first held in 1951, although an unofficial Games was previously held in 1949. ^ "Participating countries". pescara2009.it. Retrieved 15 March 2018. ^ Kosovo accepted as member of International Committee of the Mediterranean Games. ^ The games must go on: Avery Brundage and the Olympic movement, Allen Guttmann, page 225. ^ "Participation of Portugal in the MG Tarragona 2017". cijm.org.gr. Retrieved 20 August 2016. ^ "Portugal new member of the ICMG". cijm.org.gr. Retrieved 1 February 2018. ^ a b "Mediterranean Games History". Mediterranean Games Site. 2008. Retrieved 2008-10-02. ^ "International Committee of the Mediterranean Games". ^ "Pescara 2015 - Italia". www.pescara2015.it. Retrieved 15 March 2018. ^ a b c d e f g h i j k l m n o p q r s t u v w x y z aa "Medals table per country and per Games". Wikimedia Commons has media related to Mediterranean Games.